Berry Head is Torbay's most important wildlife site, with many rare plants dependent upon the thin soils, mild climate and exposed conditions of the headland. 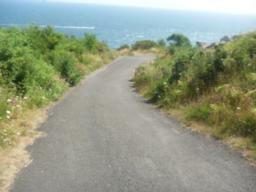 The high cliffs are home to large numbers of nesting seabirds and it is a good place to spot sea mammals. 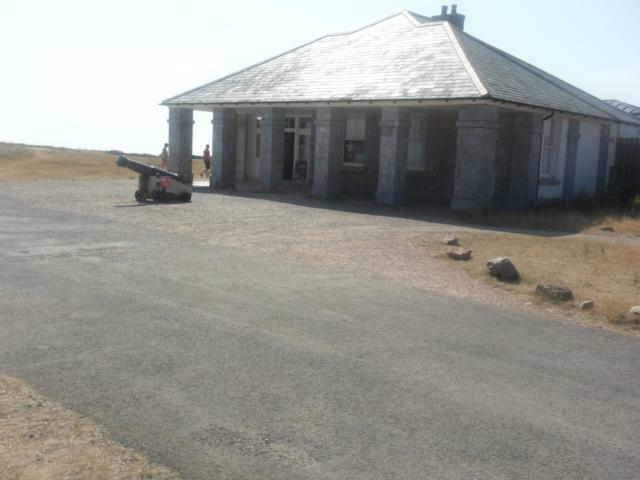 The walk also visits the two Napoleonic war forts that dominate the headland, and Britain’s highest and smallest lighthouse. 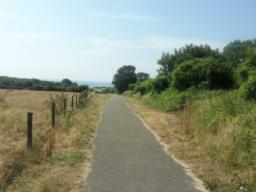 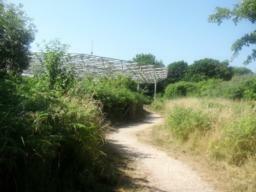 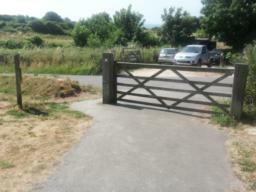 It is looked after by the Torbay Coast & Countryside Trust. Public Transport: You can reach the start of the walk by bus no. 17 (hourly service) from Brixham town centre to Victoria Road. 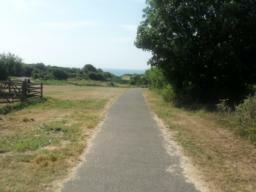 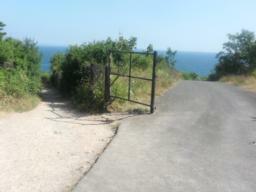 From here it is about a ½ mile walk to Berry Head. For timetable information, zoom in on the interactive map and click on the bus stops, visit Traveline or phone 0871 200 22 33. 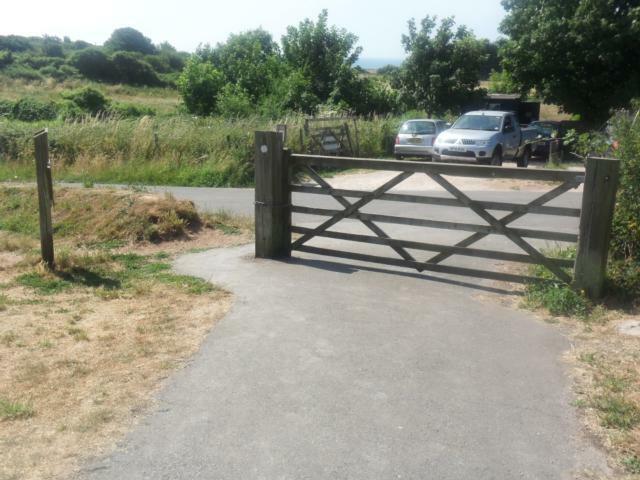 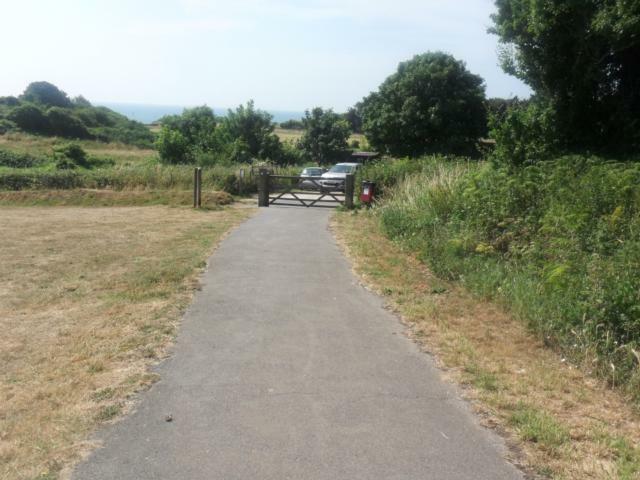 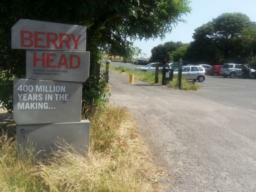 Car Park: Pay and display at Berry Head (Postcode for Sat Navs: TQ5 9AL). 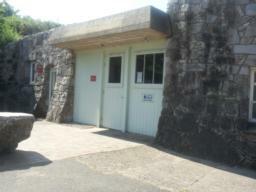 Toilets: Berry Head Visitor Centre Car Park (disabled) and Guardian Café. 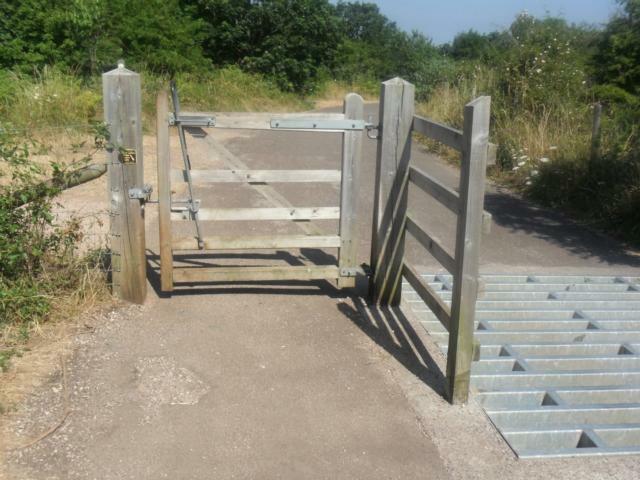 The pedestrian gate may need some assistance to open. The main tarmac track climbs gently up towards the lighthouse at the end of the headland. 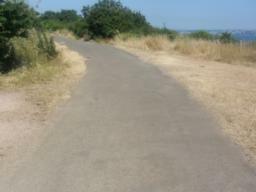 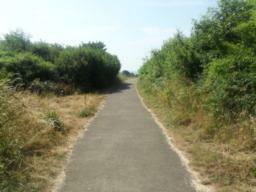 There are benches at regular intervals along the path. 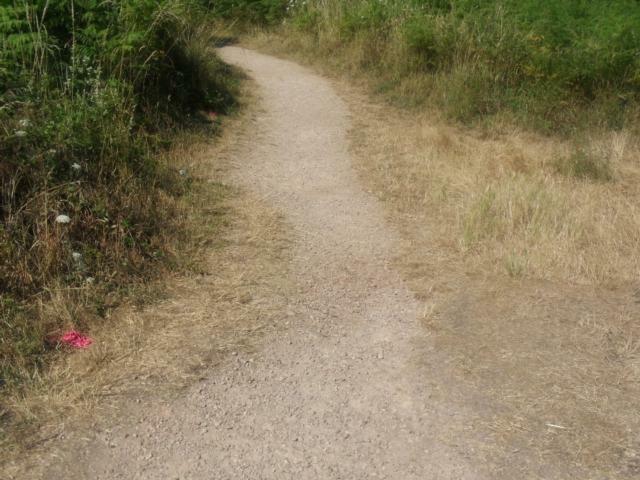 You can keep to the tarmac road or follow the gravel path. 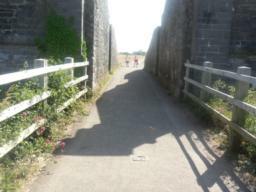 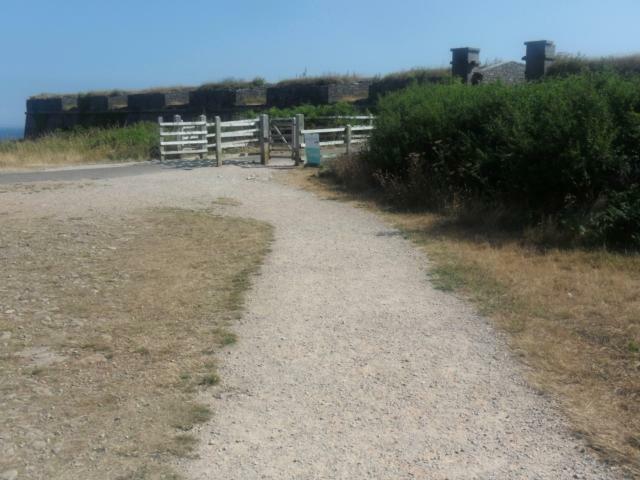 The path levels off, apart from a gentle rise and dip as you pass through the ramparts of the Northern Fort. Go through the narrow passageway between the North Fort walls, and you can imagine how difficult it would be for an enemy to get through here unscathed, with the defenders being able to attack them from above. 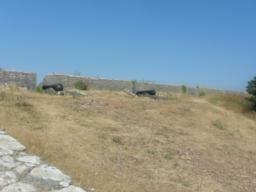 On the ramparts on the left hand side are replica cannons. Just inside the Northern Fort is a café. 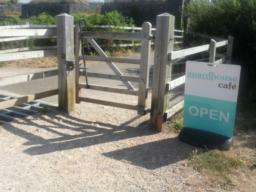 Unfortunately the toilets here are not wheelchair accessible. Behind the café, a level but slightly uneven path (short grass) leads to the viewpoint that looks directly across to the guillemot colony on the cliffs below the Southern Fort. The tarmac track ends about 50 metres before the lighthouse. 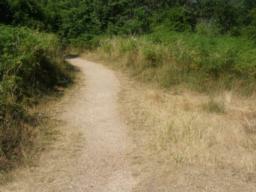 This last section is a wide rough stony track, with smoother grass on either side. 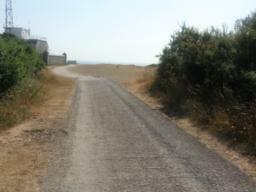 The rough wide stony track continues as far as the lighthouse. Here the exposed limestone has created a rough stony ‘ramp’ down to a smoother grassy area stretching across the last few metres to the end of the headland, where there are several seats, and a toposcope. 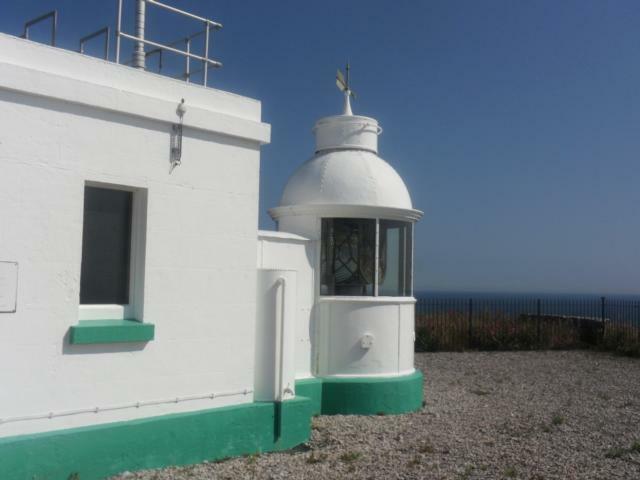 The Berry Head lighthouse came to be known as the smallest, highest and deepest light in the British Isles. 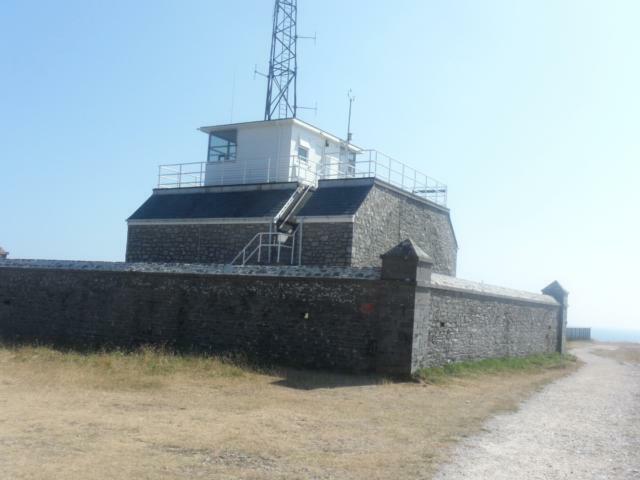 The tower is only 5m/15ft high, requiring no further elevation than that given by the 58m/180ft high headland. 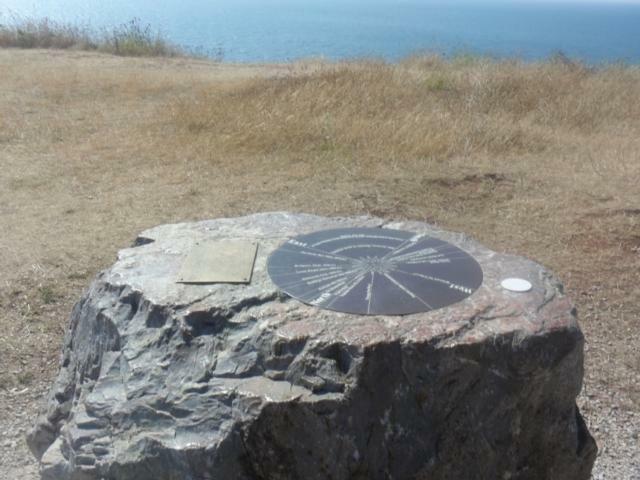 According to this toposcope from here you can see over 2000 sq km/800 sq miles of sea. 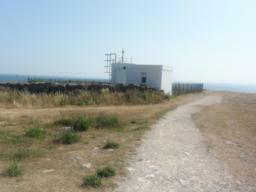 On a clear day the Isle of Portland, 42 miles away on the other side of Lyme Bay is visible. 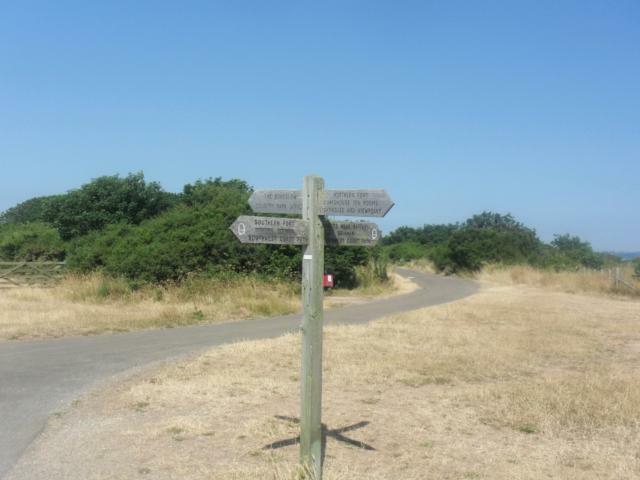 Turn right at the signpost. 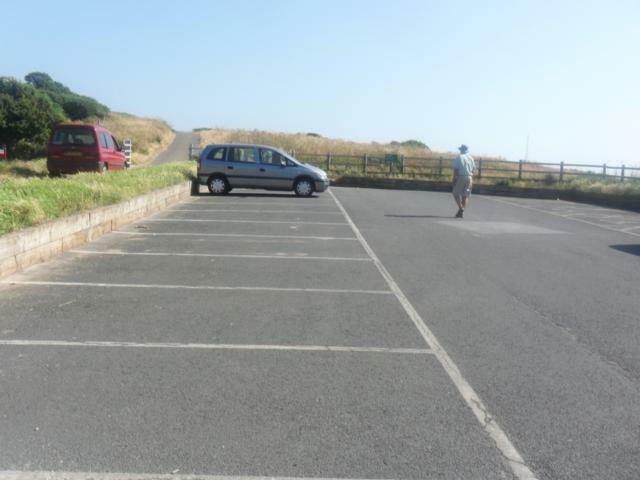 Watch out for the car ramps. 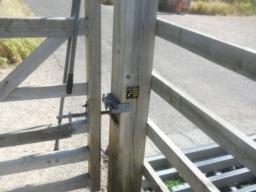 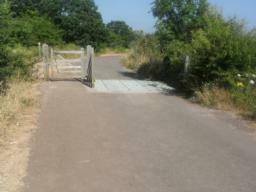 Another gate - exactly the same as the first two. 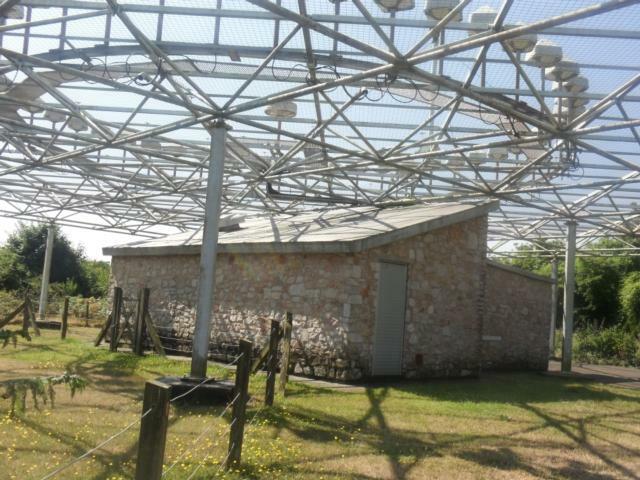 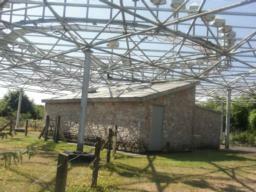 This path leads to the radio beacon. 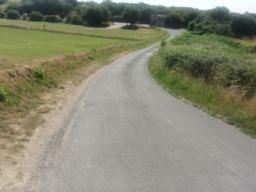 ... as it slopes 1:20 gently downhill. 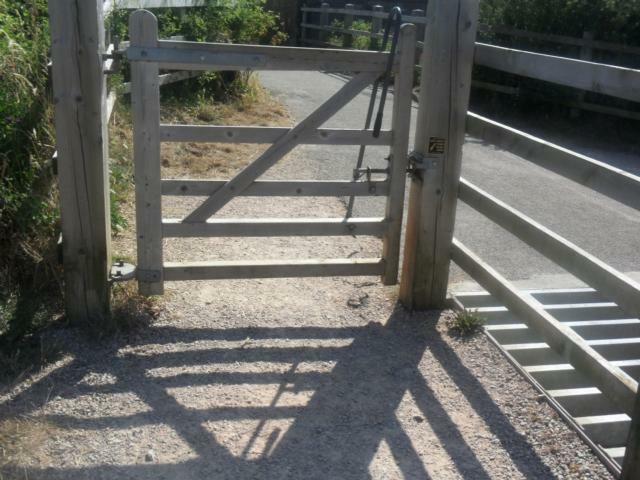 Stop when the slope becomes too steep for you. 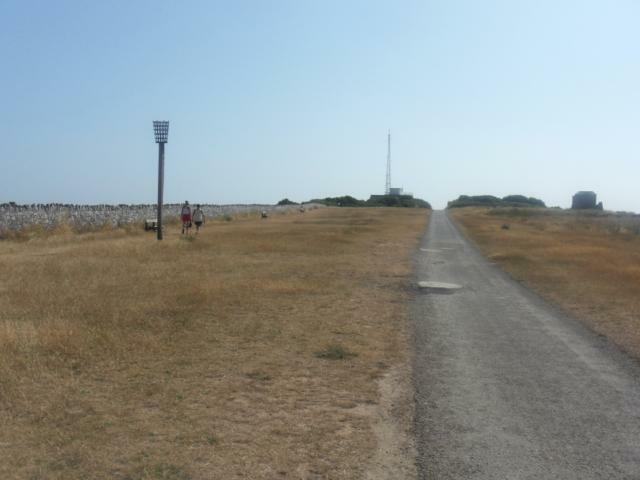 Return back to the Radio Beacon path. This time take the path leading off the tarmac track. 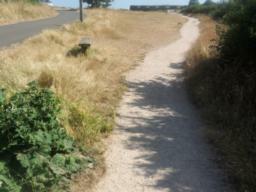 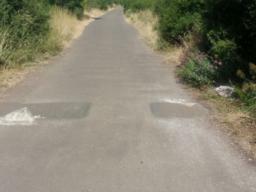 It is a 1 metre wide rolled stone path, with a slightly loose surface. 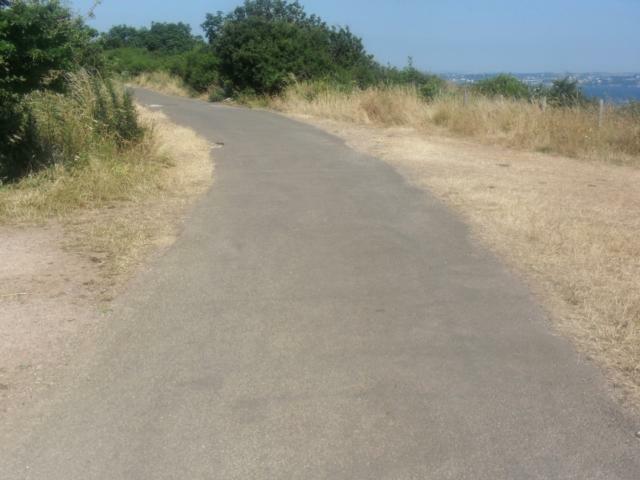 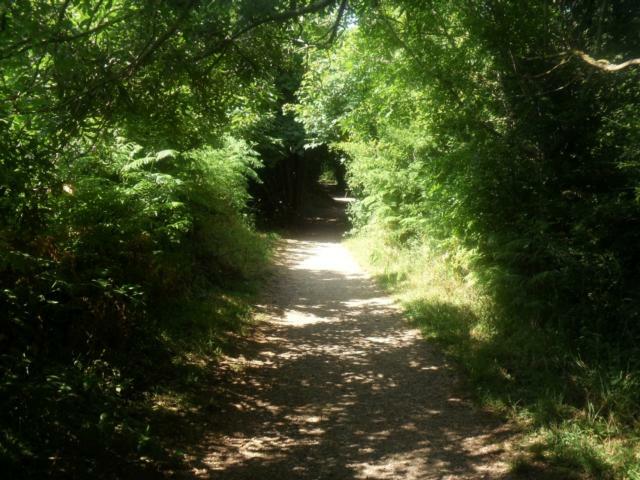 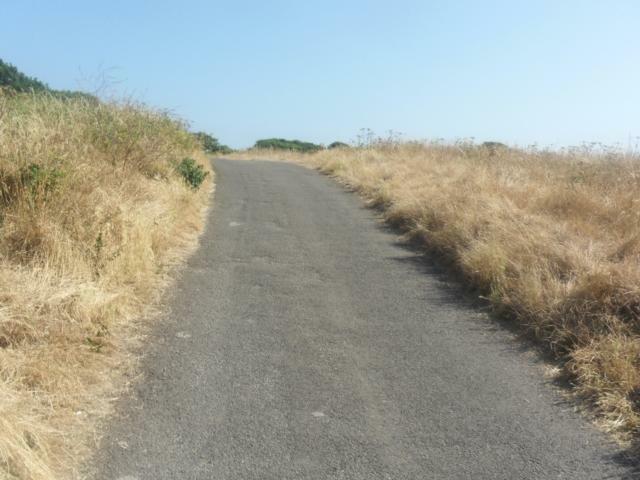 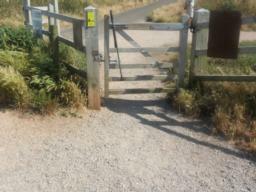 This path is virtually level apart from a short gentle descent off from the tarmac track. 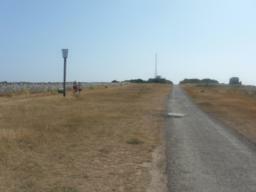 Ahead is the radio beacon. 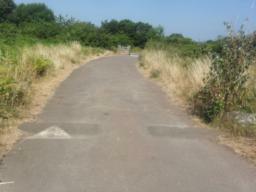 From the radio beacon onwards, there is a tarmac track. The track is initially flat, but then descends gently at first, and gradually becoming steeper. 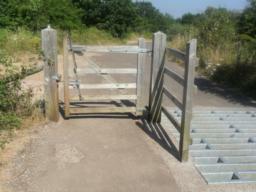 This photo shows the view at the steepest section, and the gate at the end. 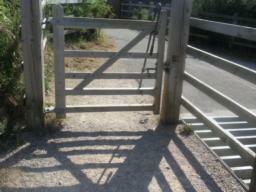 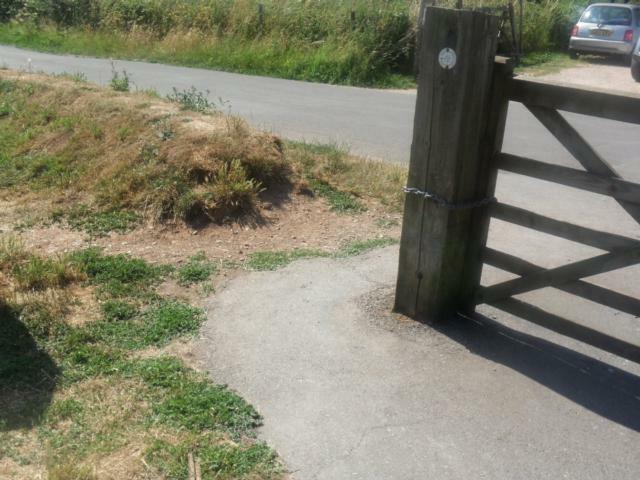 The gap beside this gate (if you go partially onto the grass) is 1.2 metres. 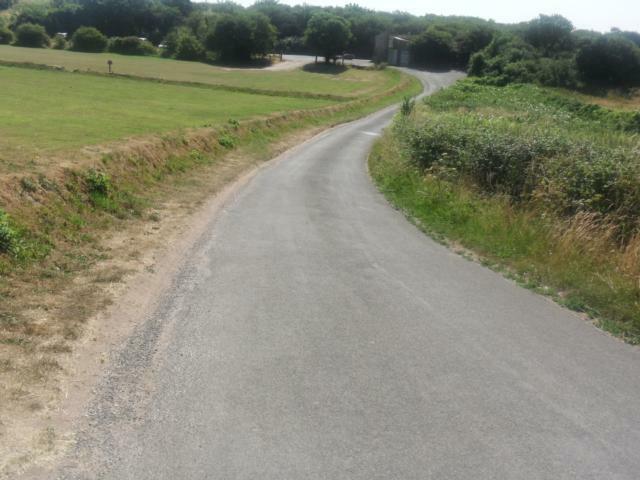 The final section is along a road, gently dipping downhill, with a shorter but slightly steeper climb of 1:20 to return up to the car park.